There are several ways to use Microsoft SharePoint within your organization. One of the easiest things you can do is embed a Questionmark Perception survey or quiz within SharePoint. To see how this would look, see a snapshot of an assessment embedded within SharePoint. Microsoft’s SharePoint is increasingly used to manage and provide access to learning content. 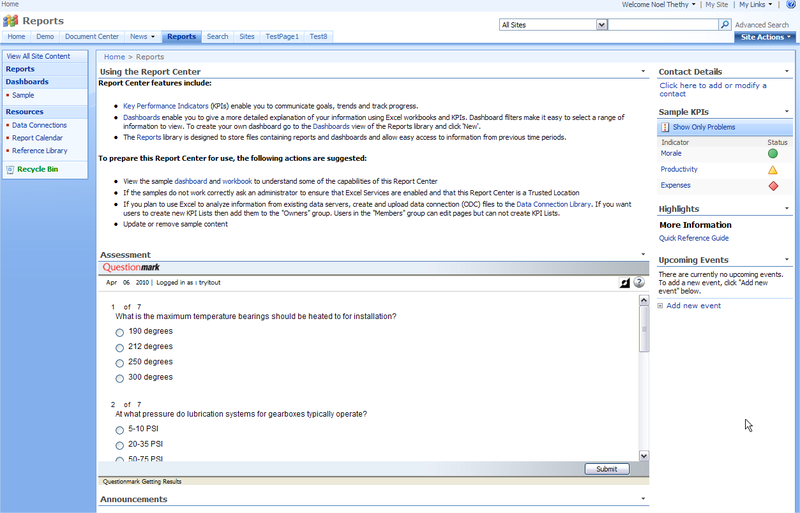 In addition to embedding assessments into SharePoint blogs, portals and wikis, you can provide single sign-on access to assessments by using a standard SharePoint page-viewer web part (if your organization uses Windows authentication) or by using Questionmark’s SharePoint Connector, an add-on that integrates Perception with Microsoft SharePoint Portal Server 2007 (SPS).